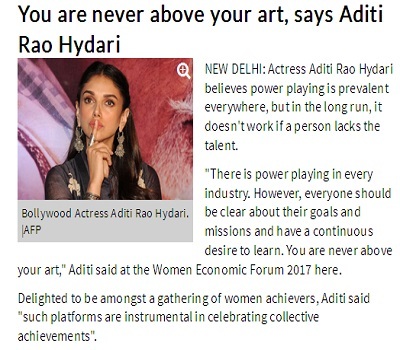 Aditi Rao Hydari has got alot of appreciation for her Tamil film Kaatru Veliyidai, helmed by filmmaker Mani Ratnam. 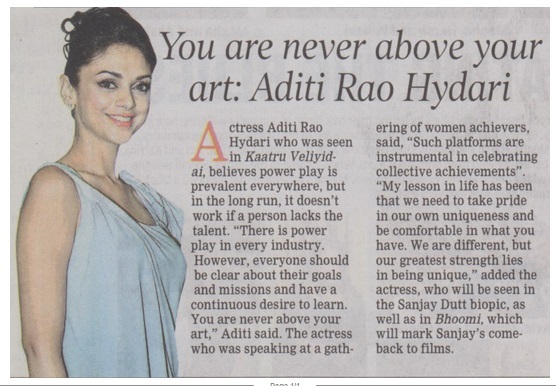 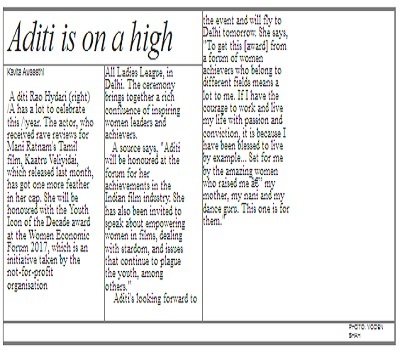 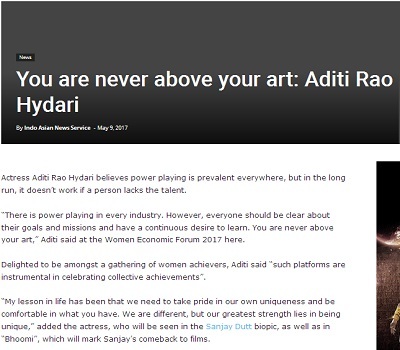 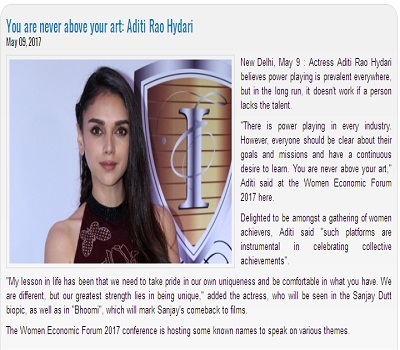 Actor Aditi Rao Hydari got a lot of appreciation for her Tamil film Kaatru Veliyidai, helmed by Mani Ratnam. 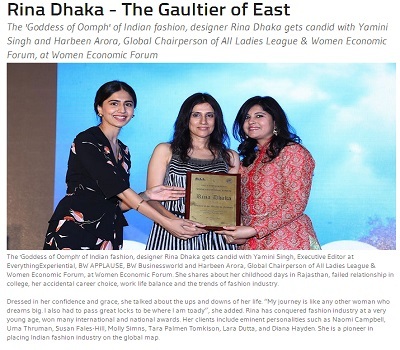 The ‘Goddess of Oomph’ of Indian fashion, designer Rina Dhaka gets candid with Yamini Singh, Executive Editor at EverythingExperiential. 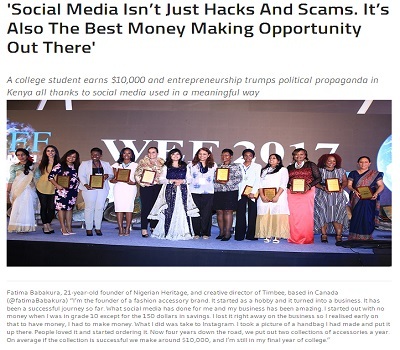 A college student earns $10,000 and entrepreneurship trumps political propaganda in Kenya all thanks to social media used in a meaningful way. 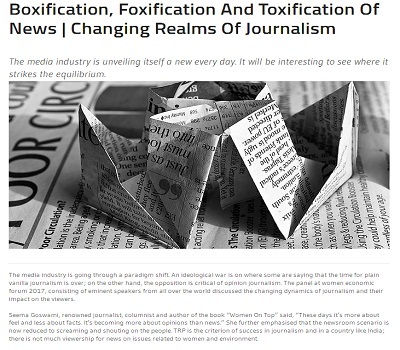 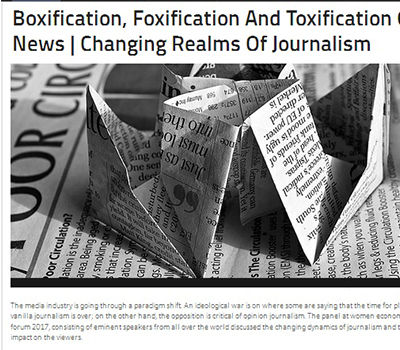 The media industry is unveiling itself a new every day. 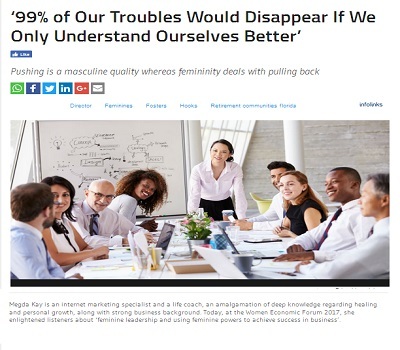 It will be interesting to see where it strikes the equilibrium. 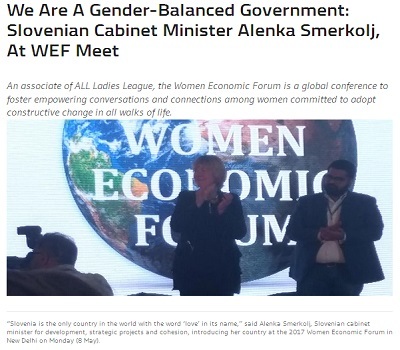 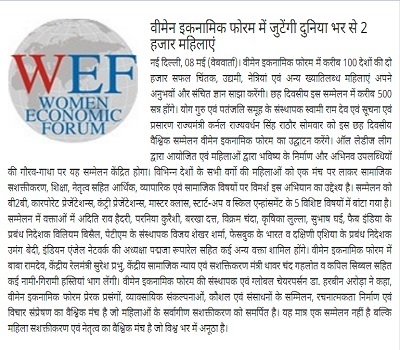 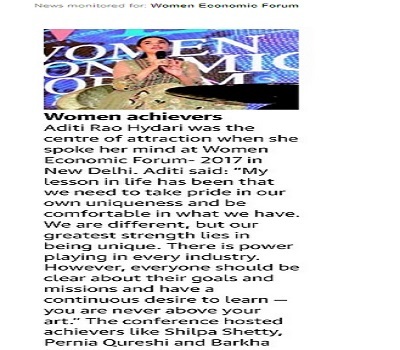 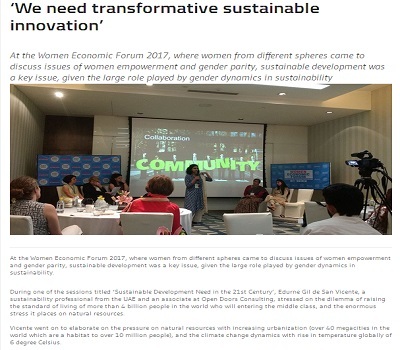 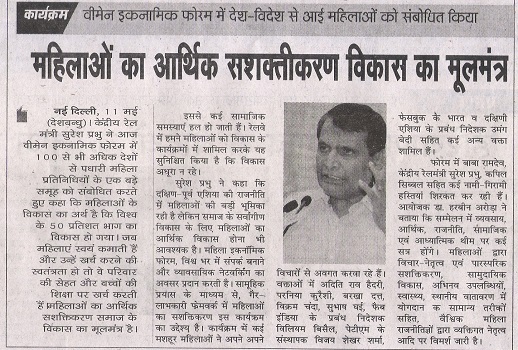 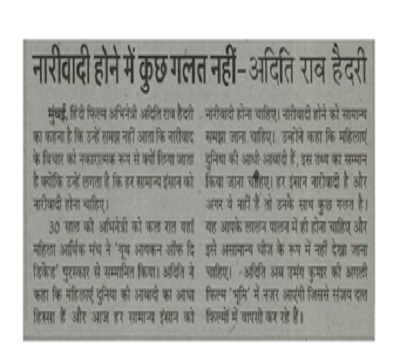 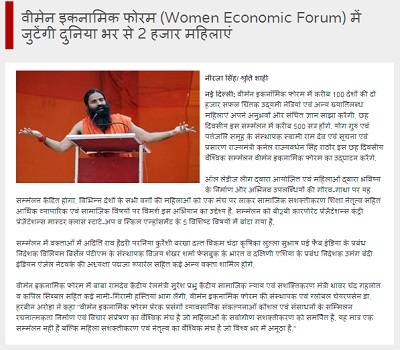 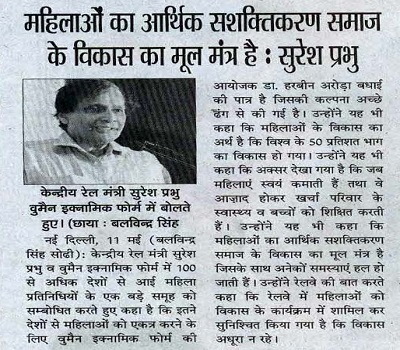 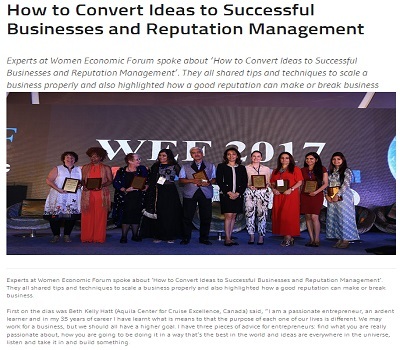 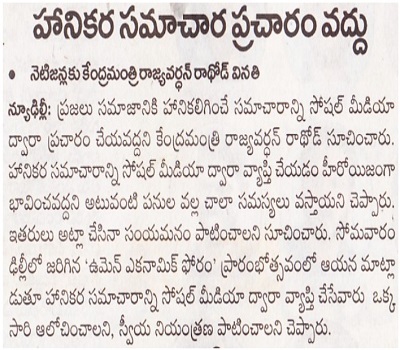 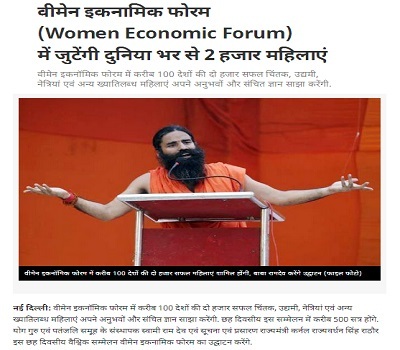 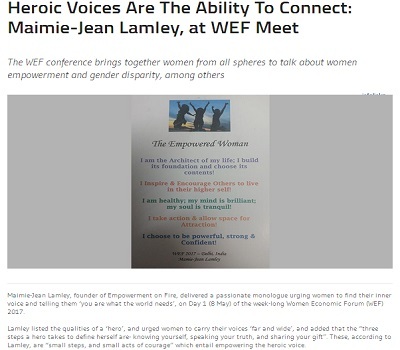 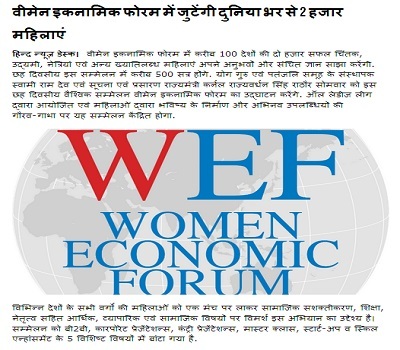 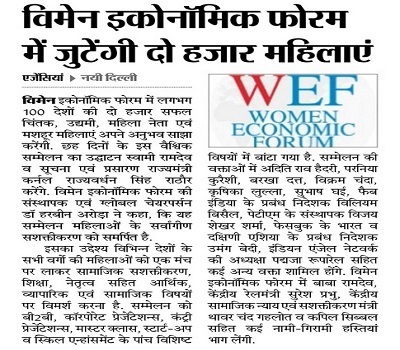 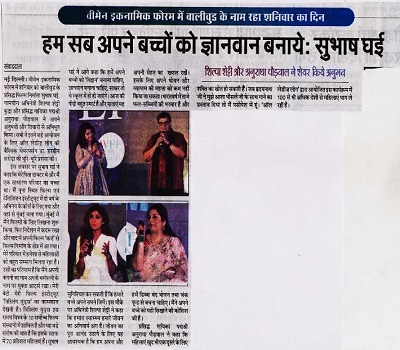 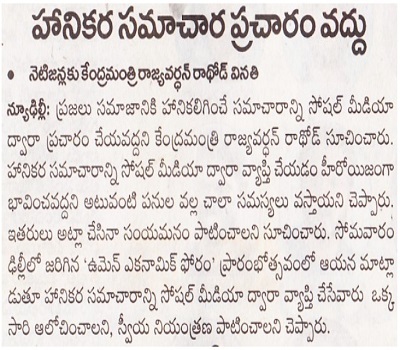 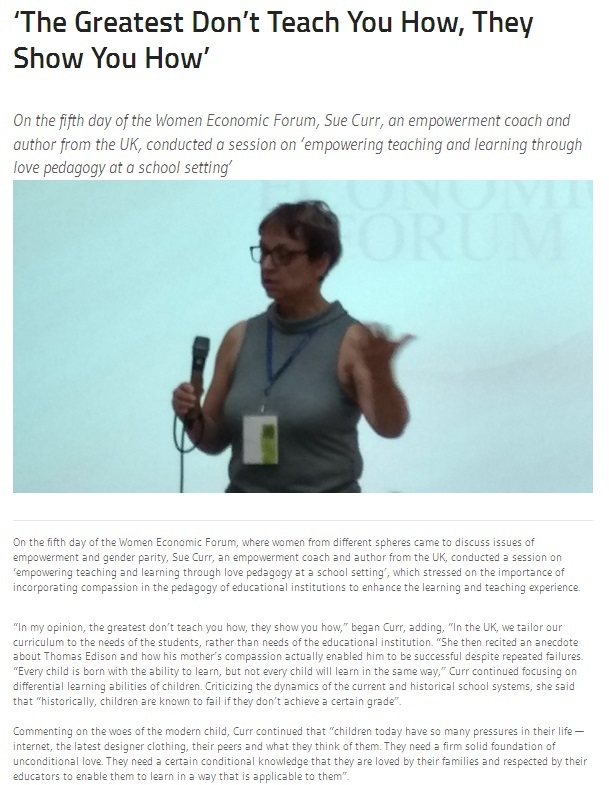 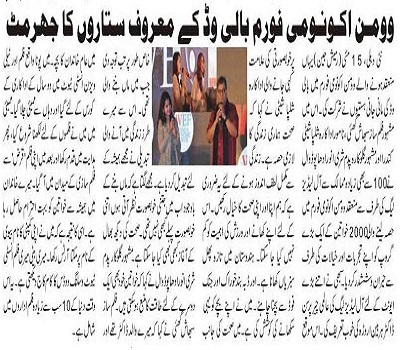 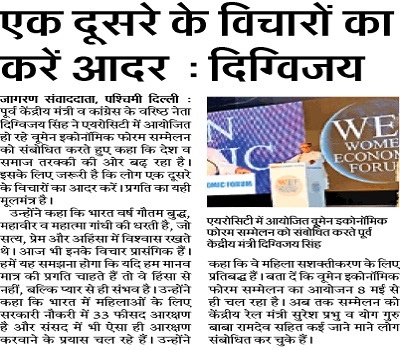 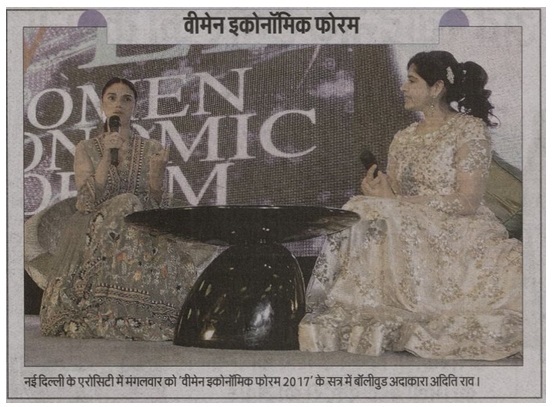 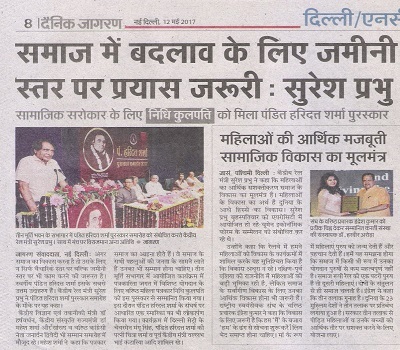 Experts at Women Economic Forum spoke about ‘How to Convert Ideas to Successful Businesses and Reputation Management’. 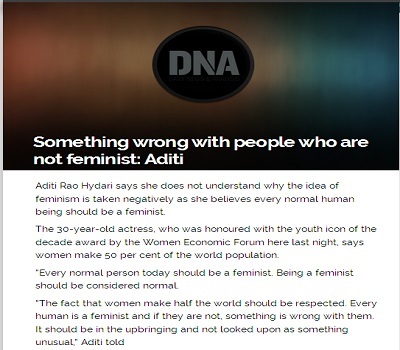 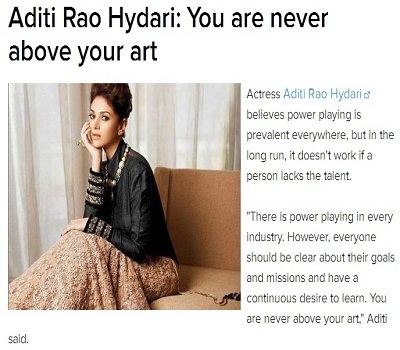 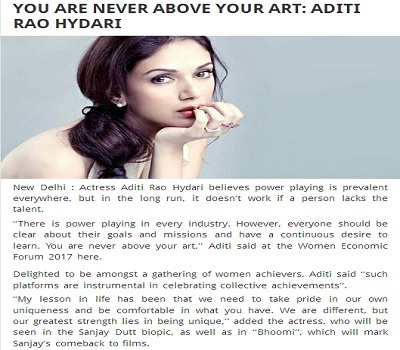 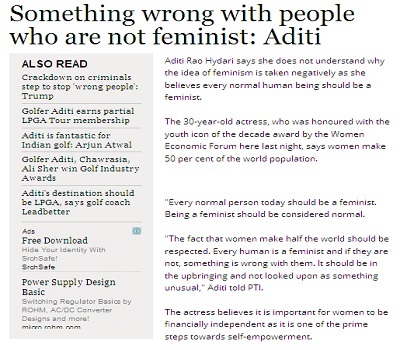 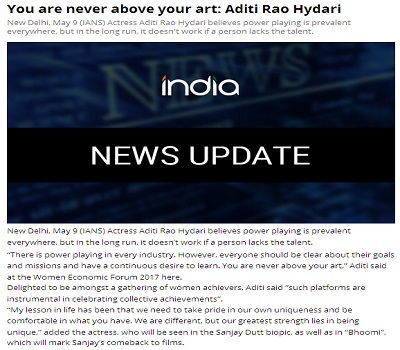 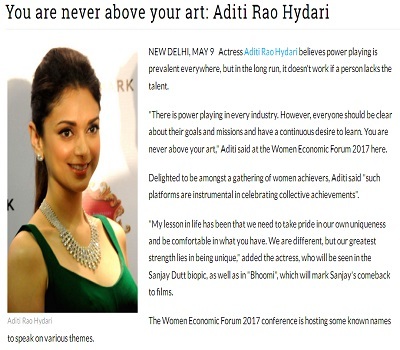 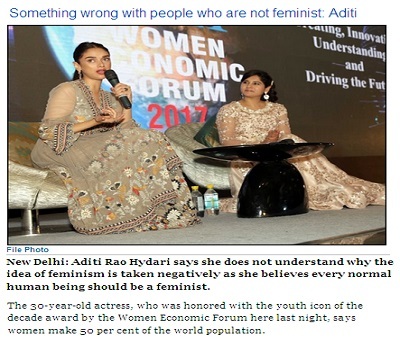 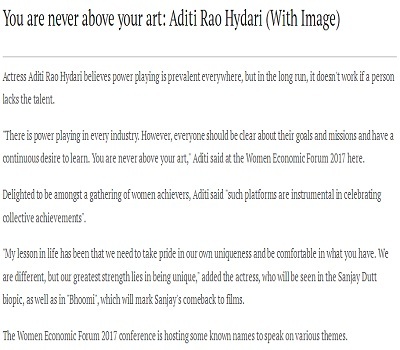 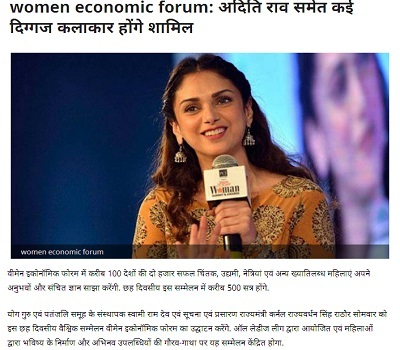 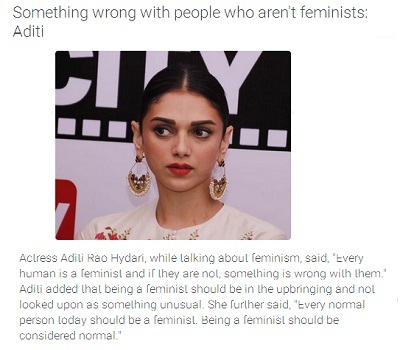 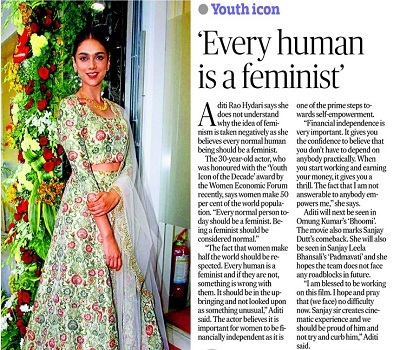 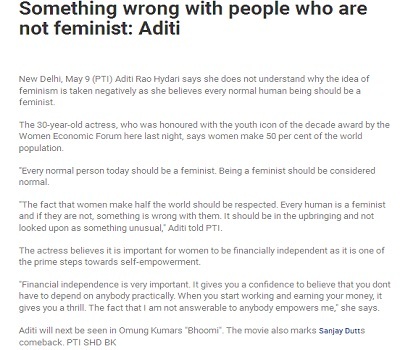 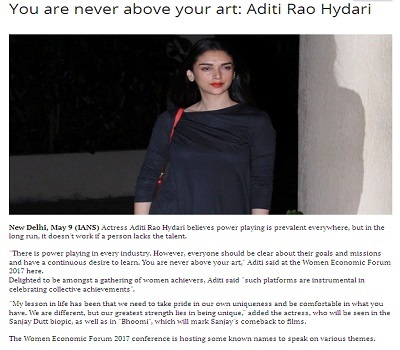 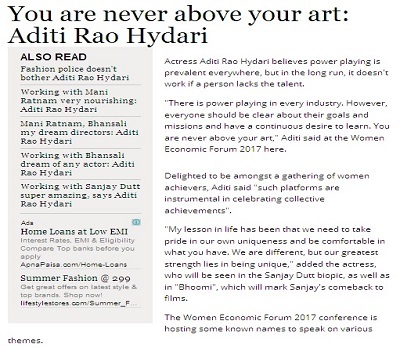 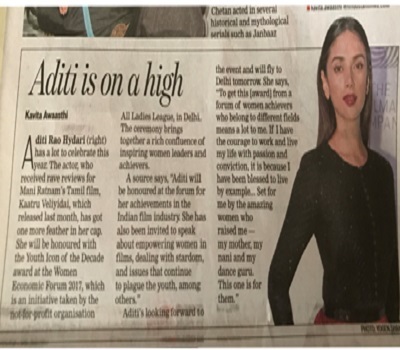 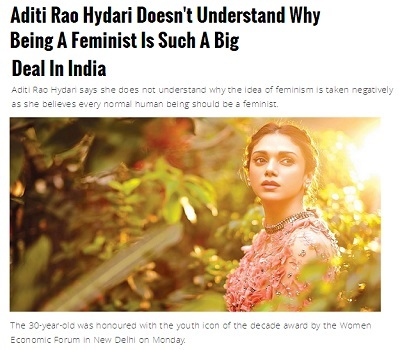 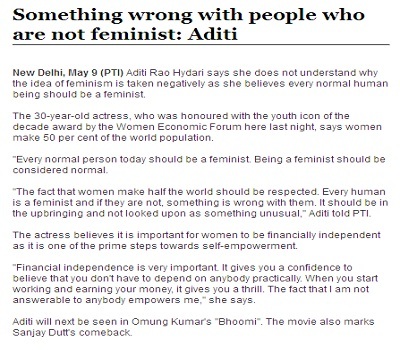 Aditi Rao Hydari says she does not understand why the idea of feminism is taken negatively as she believes every normal human being should be a feminist. 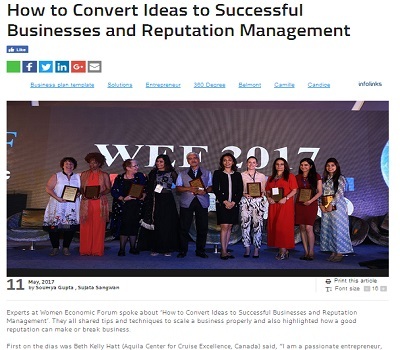 Megda Kay is an internet marketing specialist and a life coach, an amalgamation of deep knowledge regarding healing and personal growth. 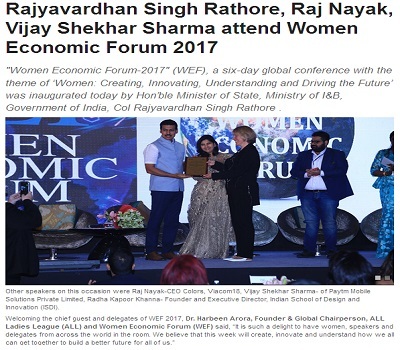 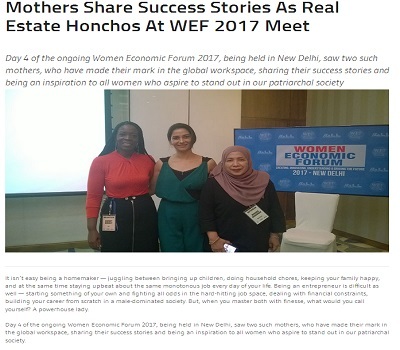 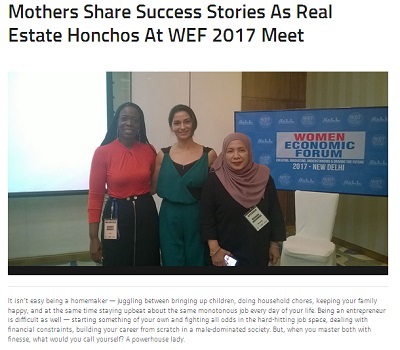 Day 4 of the ongoing Women Economic Forum 2017, being held in New Delhi, saw two such mothers, who have made their mark in the global workspace. 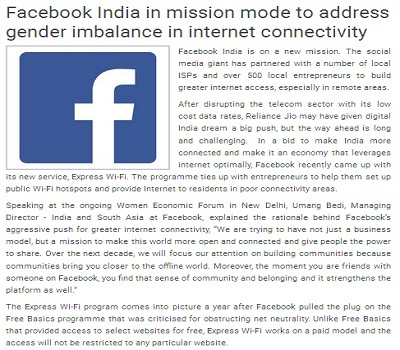 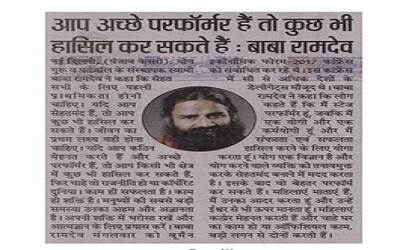 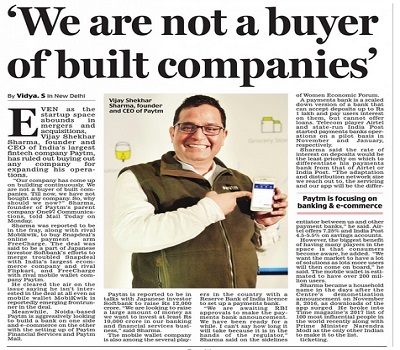 Facebook India is on a new mission. 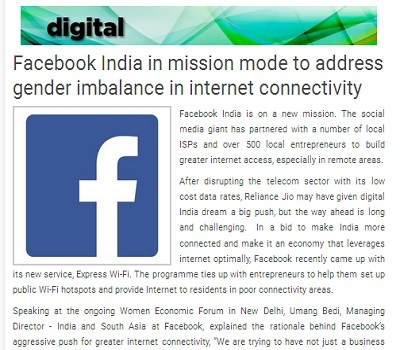 The social media giant has partnered with a number of local ISPs and over 500 local entrepreneurs to build greater internet access, especially in remote areas. 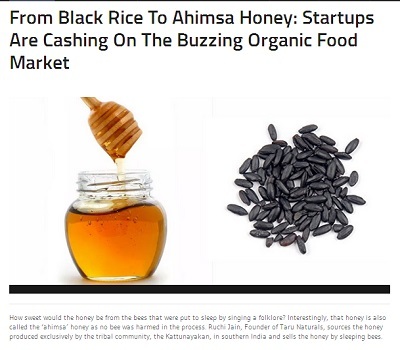 Ruchi Jain, Founder of Taru Naturals, sources the honey produced exclusively by the tribal community, the Kattunayakan. 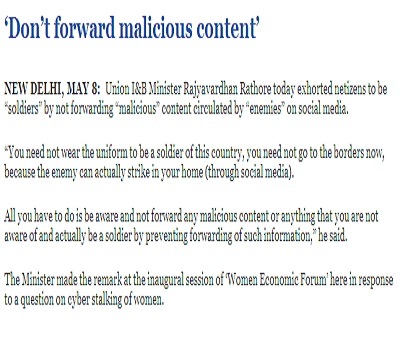 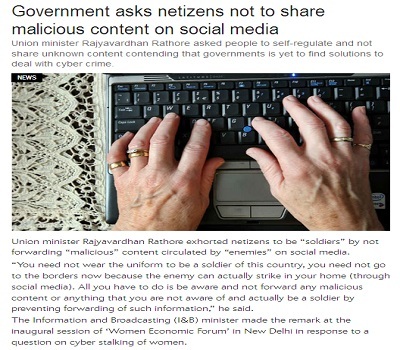 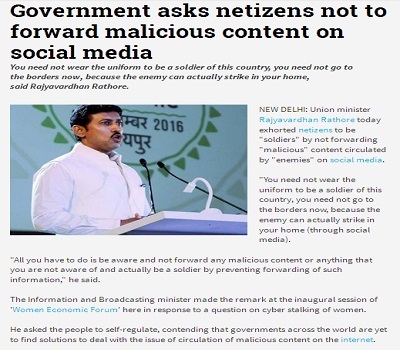 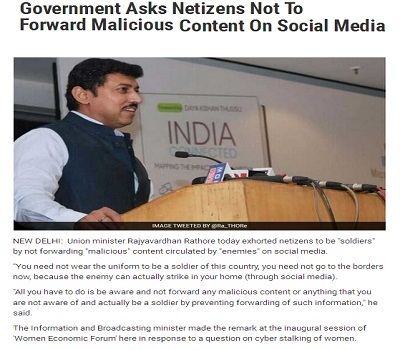 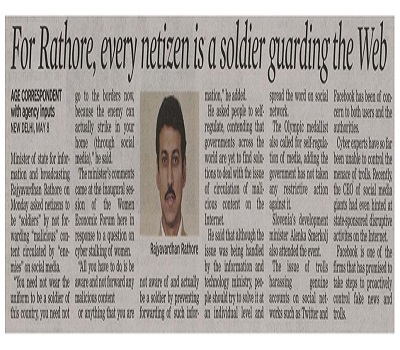 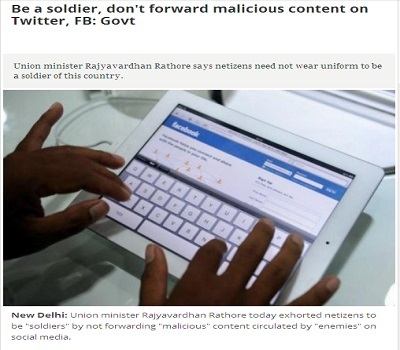 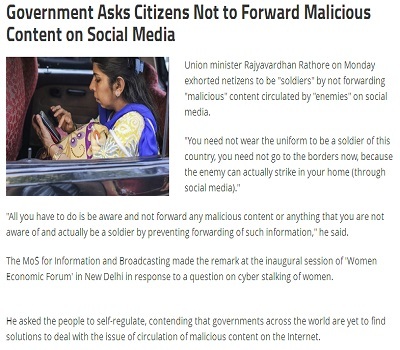 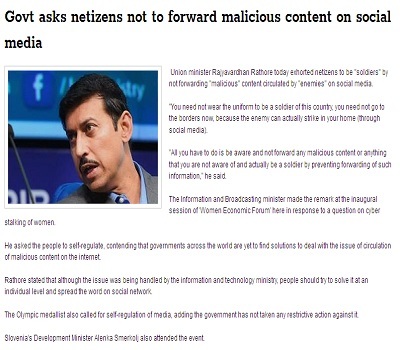 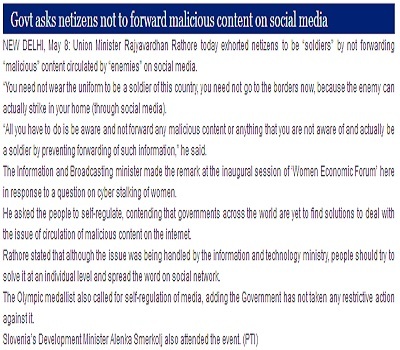 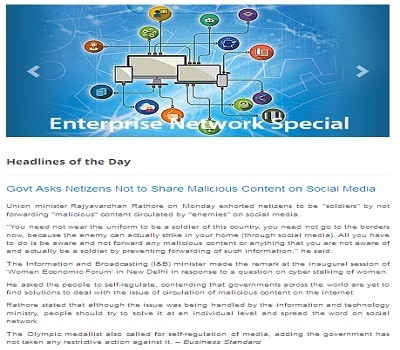 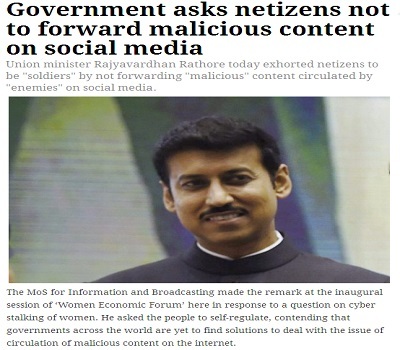 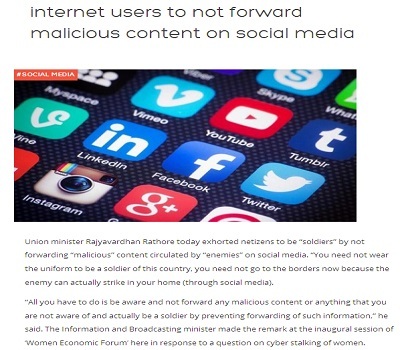 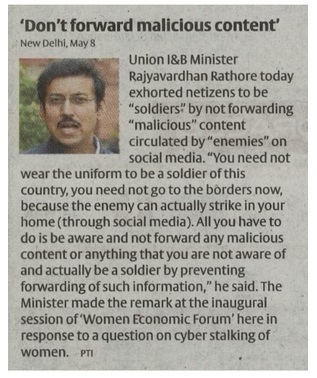 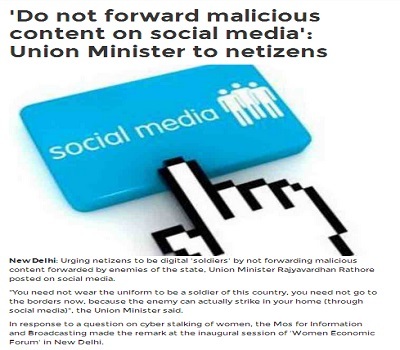 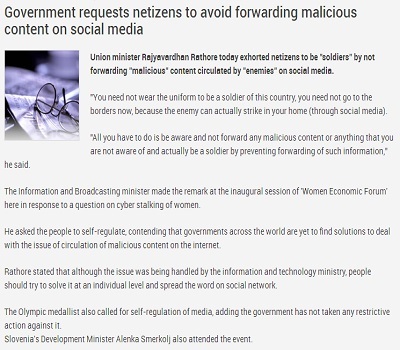 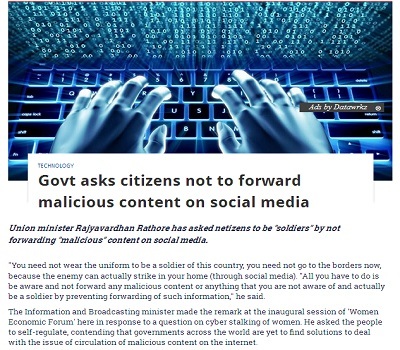 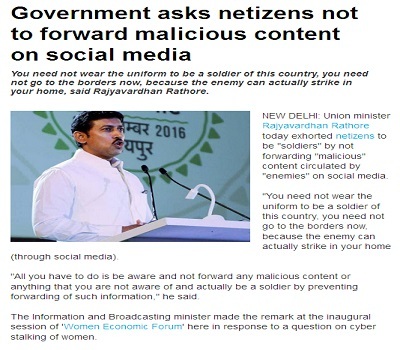 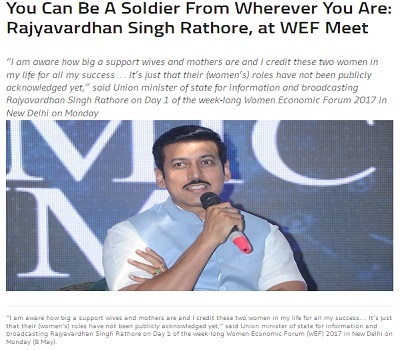 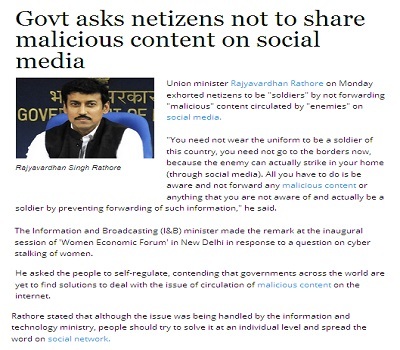 Union minister Rajyavardhan Rathore has asked netizens to be “soldiers” by not forwarding “malicious” content on social media. 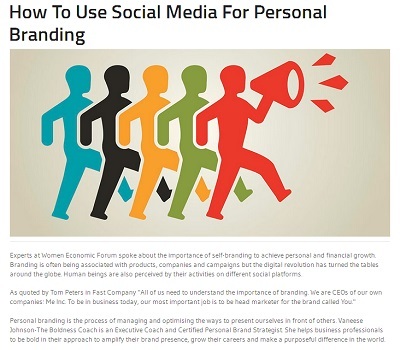 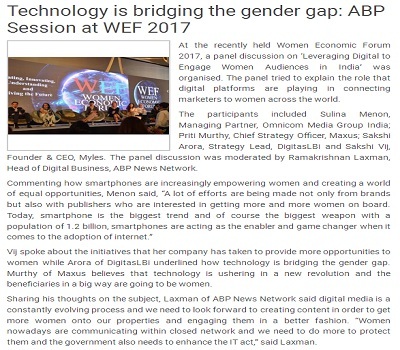 Branding is often being associated with products, companies and campaigns but the digital revolution has turned the tables around the globe. 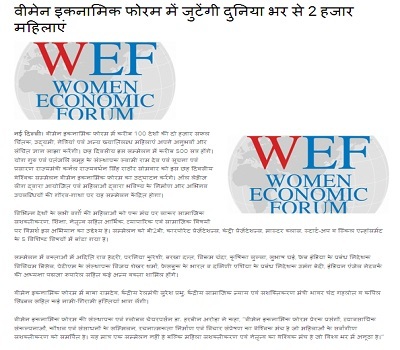 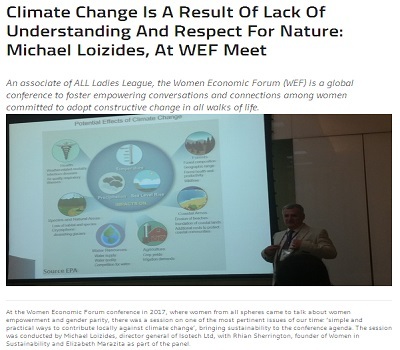 The second day of the ongoing Women Economic Forum in New Delhi saw Polish Ambassador to India, Tomasz Lukaszuk, speaking on women rights and start-up culture in Poland, and what lies ahead for budding entrepreneurs in India. 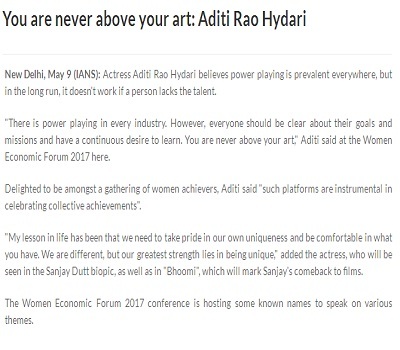 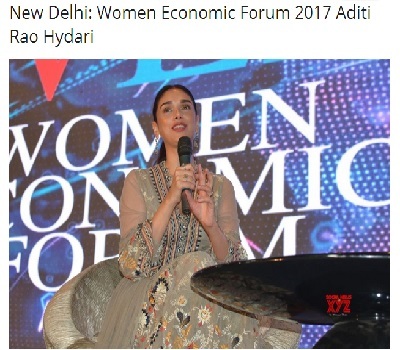 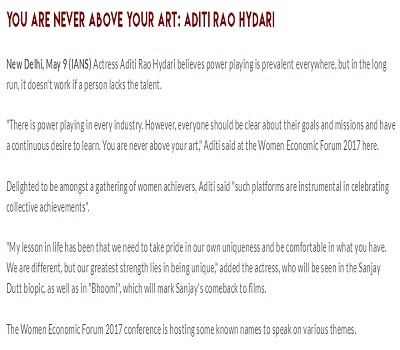 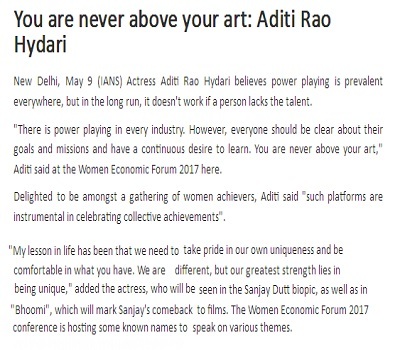 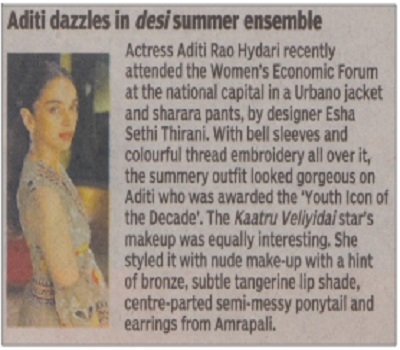 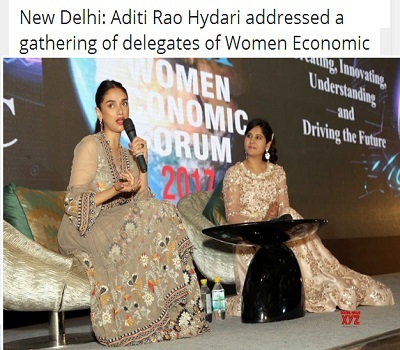 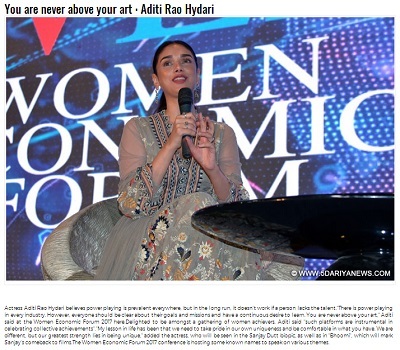 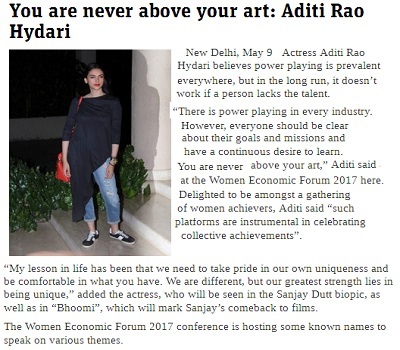 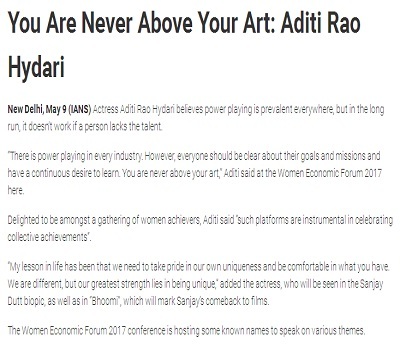 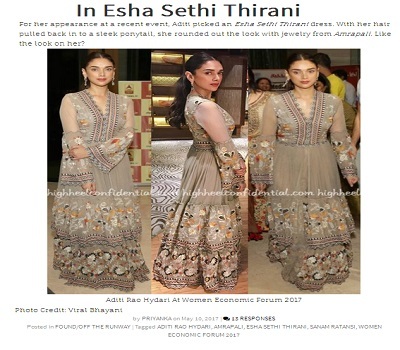 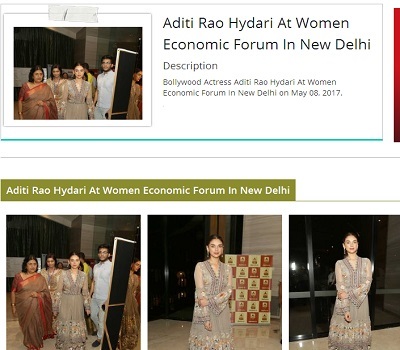 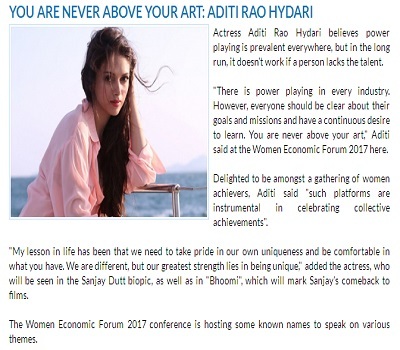 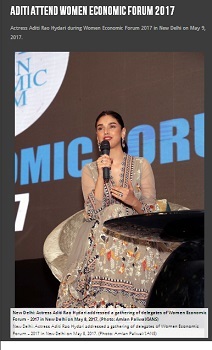 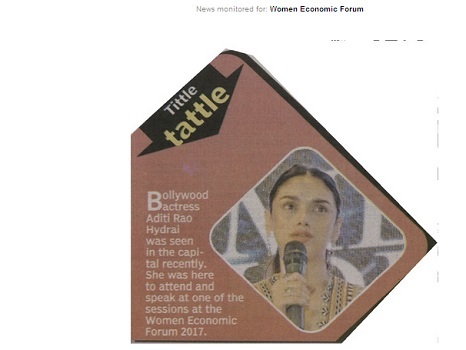 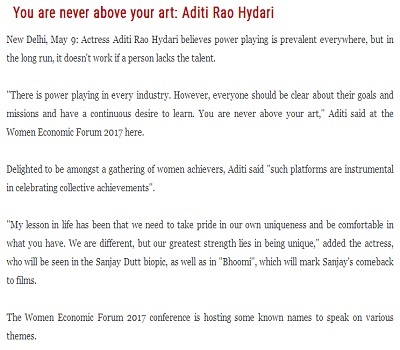 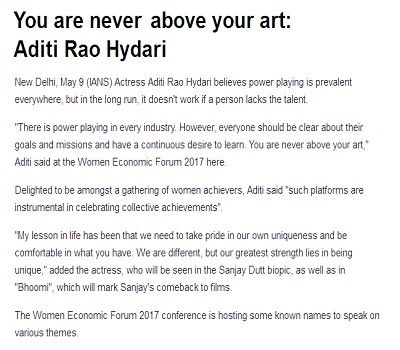 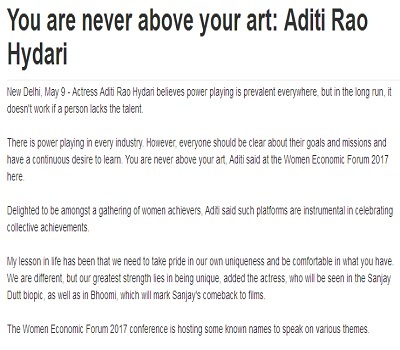 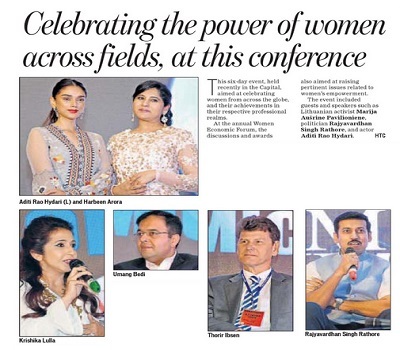 Actress Aditi Rao Hydari during Women Economic Forum 2017 in New Delhi on May 9, 2017. 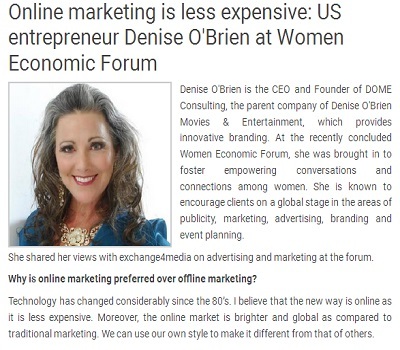 Do You Have A Market For Your Venture? 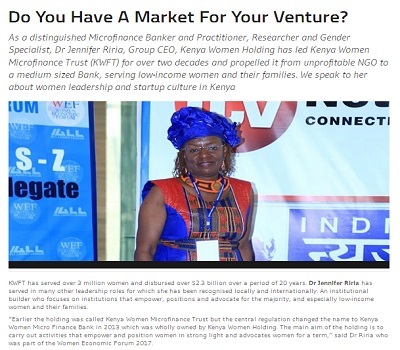 As a distinguished Microfinance Banker and Practitioner, Researcher and Gender Specialist, Dr Jennifer Riria, Group CEO, Kenya Women Holding has led Kenya Women Microfinance Trust. 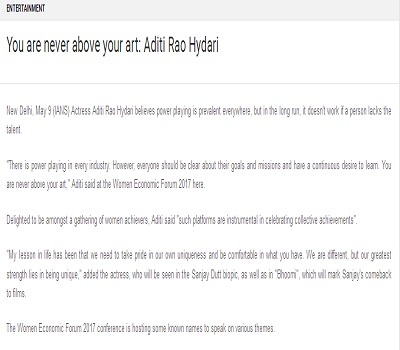 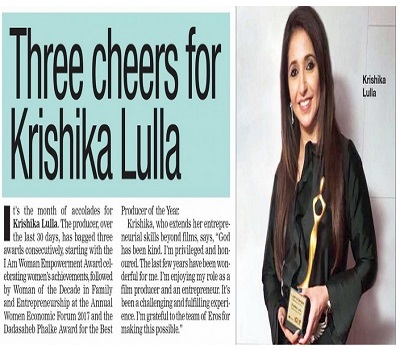 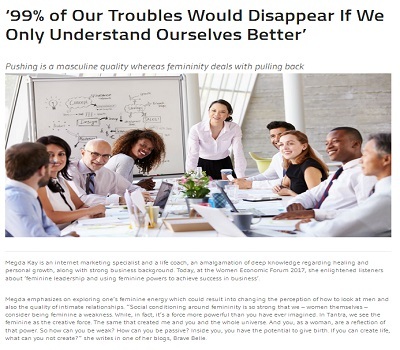 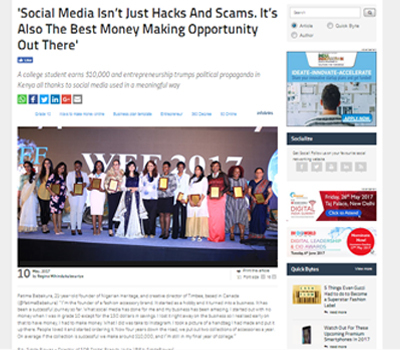 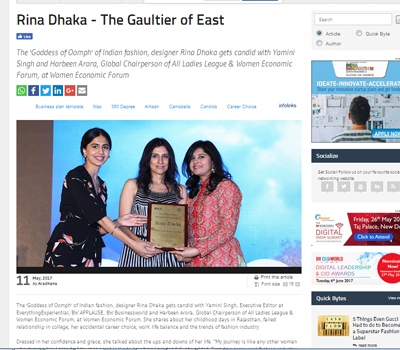 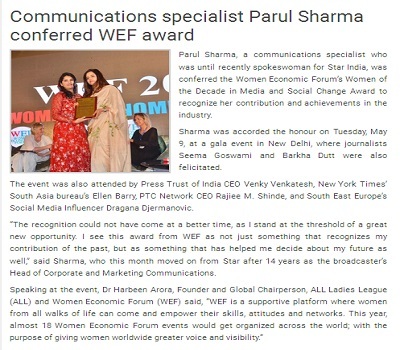 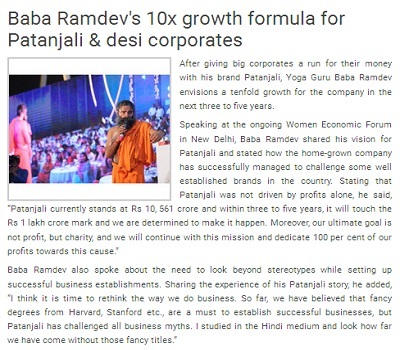 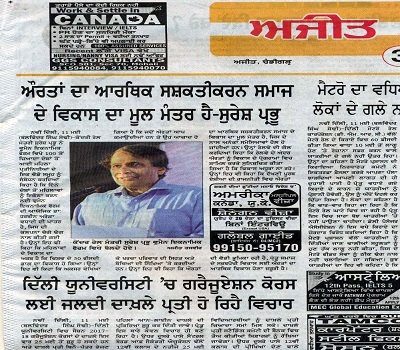 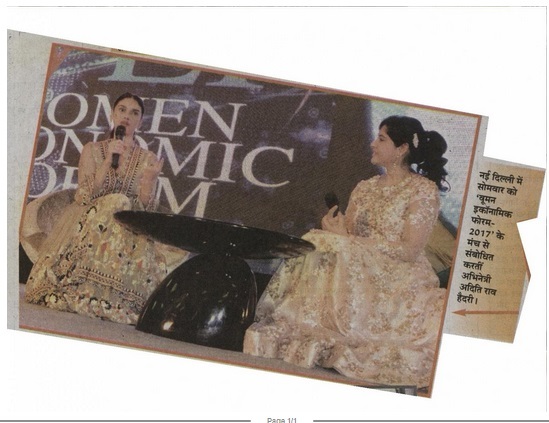 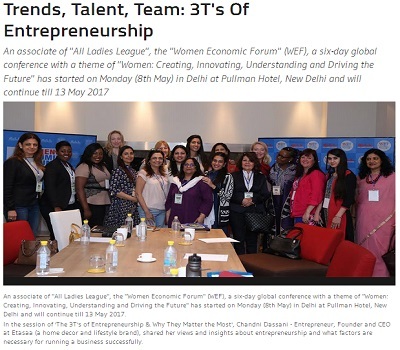 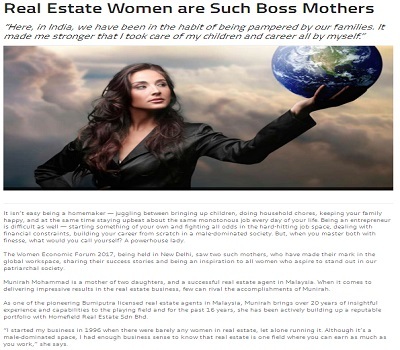 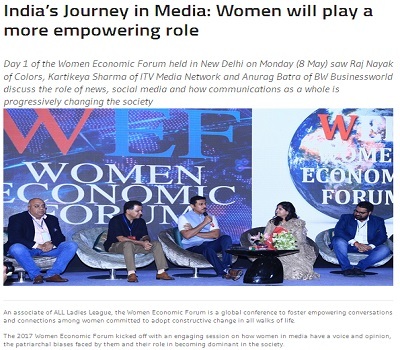 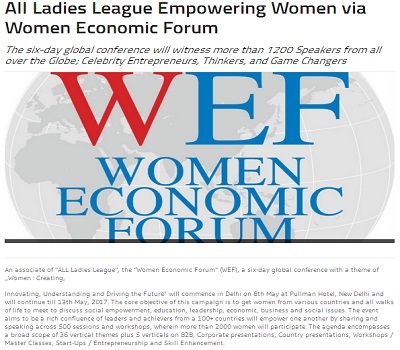 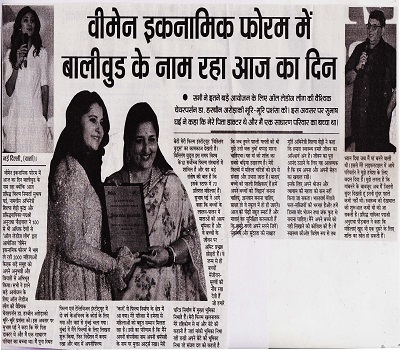 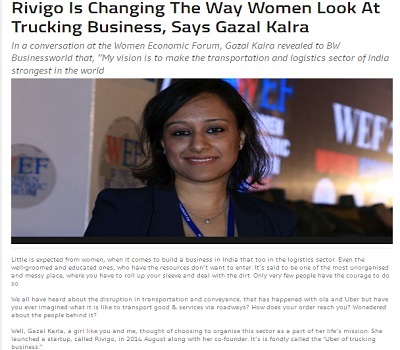 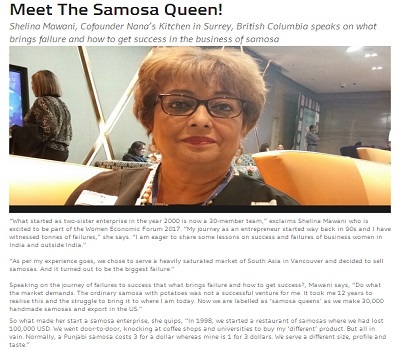 In a conversation at the Women Economic Forum, Gazal Kalra revealed to BW Businessworld. 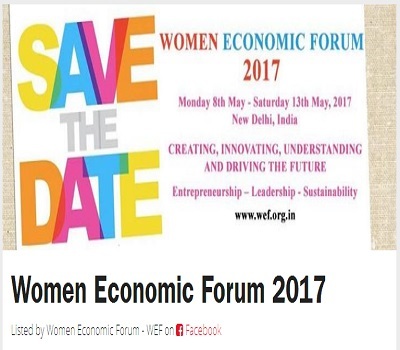 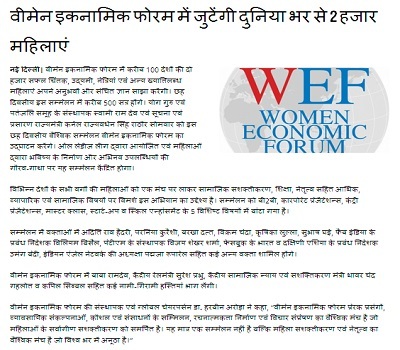 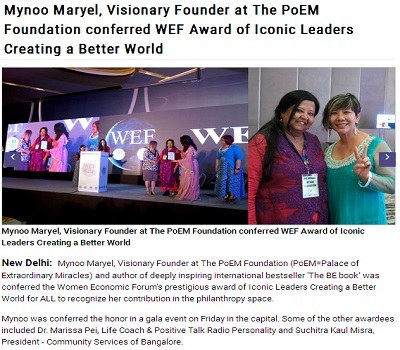 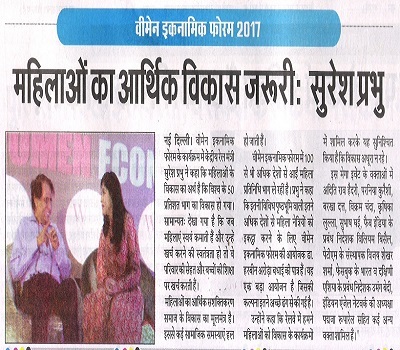 In an interaction with Sujata Sangwan of BW Disrupt, Priyanka Goel, Co-founder, Gogrub shared details about her venture at Women Economic Forum (WEF) conference. 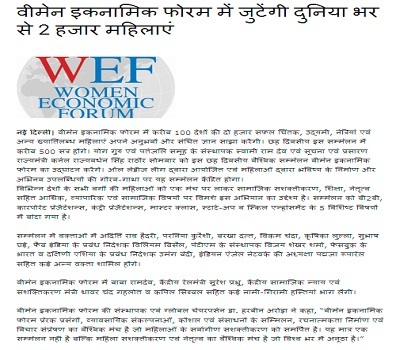 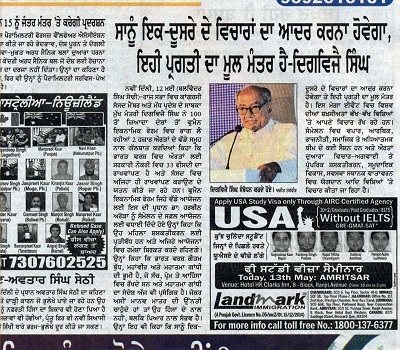 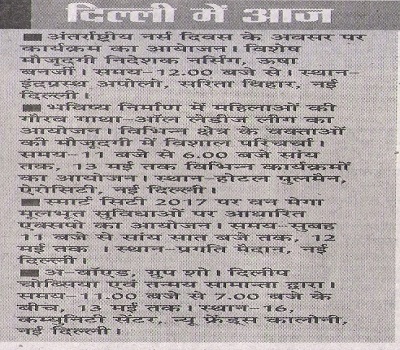 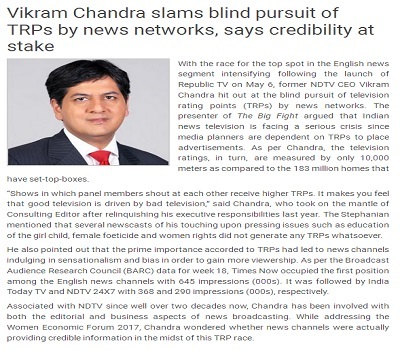 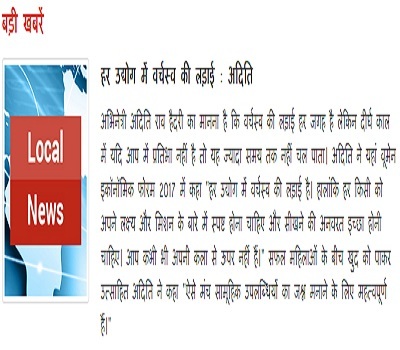 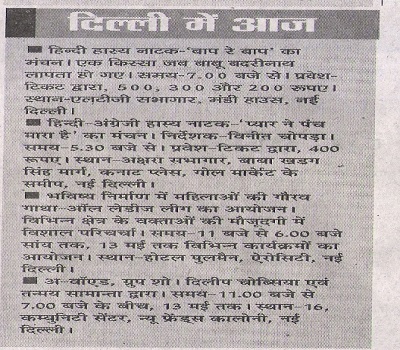 अभिनेत्री अदिति राव हैदरी का मानना है कि वर्चस्व की लड़ाई हर जगह है, लेकिन दीर्घ काल में यदि आप में प्रतिभा नहीं है तो यह ज्यादा समय तक नहीं चल पाता. 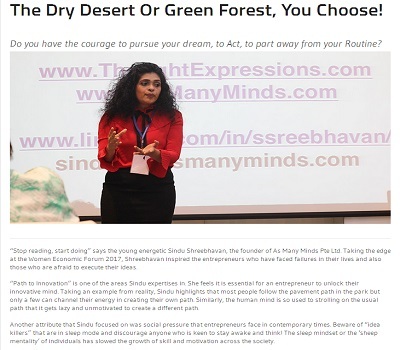 The Dry Desert Or Green Forest, You Choose! 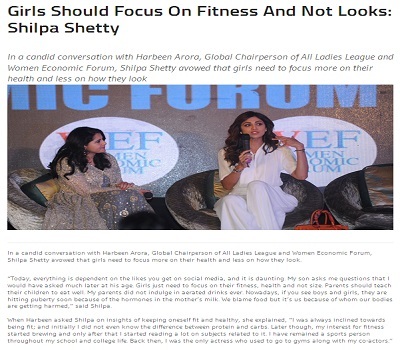 New Delhi , May 13 : Actress Shilpa Shetty feels people should take some time out of their busy schedules to take care of their health.